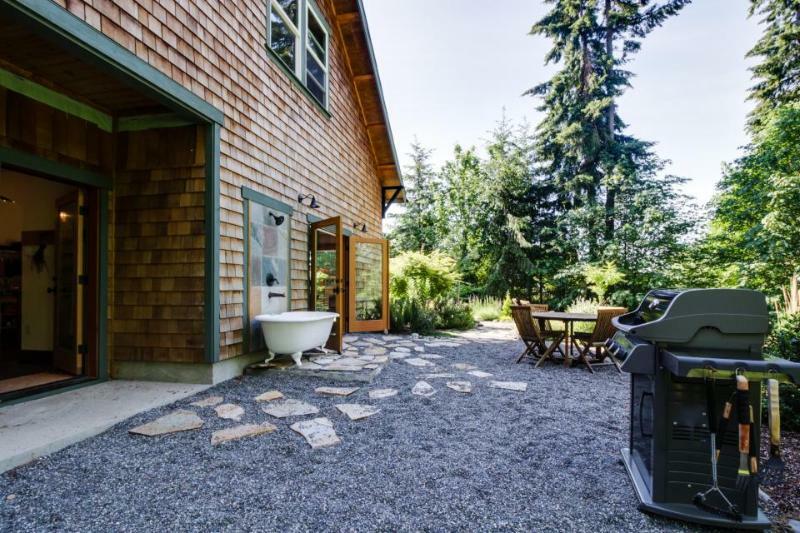 Escape to scenic Bainbridge Island at this truly inspiring artist's cottage, sitting on just under an acre of property. Surrounded by old-growth trees and lovely gardens outside, inside you will be treated to wonderful artwork, antiques, and a spacious, open floor plan. 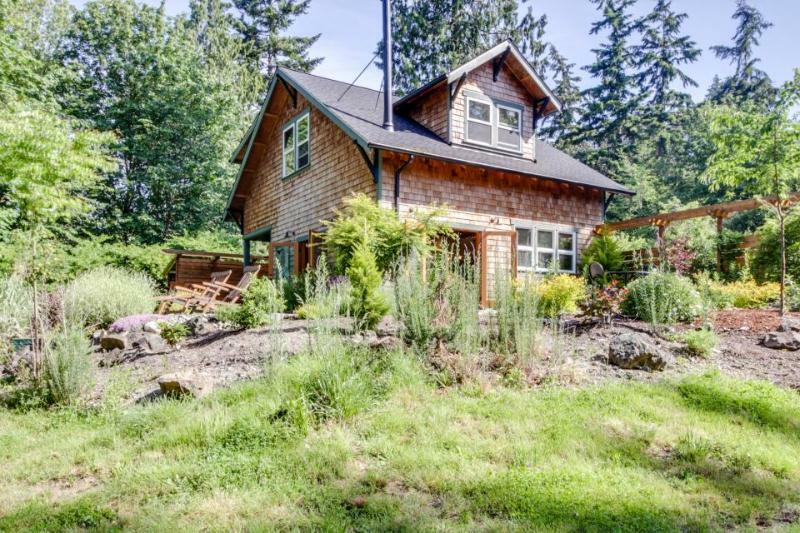 Located on the south end of Bainbridge Island, between Fort Ward and the town of Bainbridge, this charming home is nothing short of an inspiration. Relax outside on your patio, take a drive into town (or a day trip to Seattle on the ferry), or stroll over to Fort Ward Park, which offers wonderful opportunities for biking, boating, and scuba diving. You can work away at your next artistic endeavor among reclaimed wood accents and a bright, welcoming design. The open living area, dining room, and kitchen are all one big room, bordered by magical twinkle lights on the ceiling, and two sets of French doors open out to the lovely patio. Cozy up on the couch in the living area, bringing wood in from the shed to light up the wood stove or opening the French doors to let a light breeze whisper in through the doors. Bring your own books if you wish, or borrow a few from this homeâs collection. The sofa faces the doors to the patio so you can look out at the trees while you paint, write, or draw. Need to break out of your artistic bubble to send a quick work email or update a coworker on a project? Donât worry - thereâs WiFi. You'll have high-end appliances in the kitchen (minus a dishwasher), and an array of pots and pans hanging from the walls for a rustic look. The exposed shelves offer dishes, silverware, and all the small appliances you could ask for, from a toaster to a coffeemaker and grinder. A wooden table in the center of the room serves as a kitchen island and a place to eat or drink coffee with two swiveling bar stools. Just off the kitchen, tucked into its own corner of the room by the second set of French doors, a sturdy dining table seats four. Up to four guests will feel right at home here in two bedrooms, both with queen beds, and one-and-a-half bathrooms. The master bedroom upstairs has a queen bed with an elegant chandelier overhead, and connects to a full bathroom with a clawfoot tub and shower nozzle - fill up the tub with bubbles and take a long, soothing soak with a glass of wine, or, on a warm night, step outside to the outdoor clawfoot bathtub (yes, you read that right!) to do the same. A second bedroom upstairs has a queen bed and an adjacent bathroom with a standalone shower. Your home also comes equipped with a private washer and dryer to keep your things fresh and clean and ready for another day of exploring the island, as well as an additional half-bathroom with a toilet and sink inside the laundry area. Step outside and observe the lovely gardens, full of birds, or stay inside and read a book (or write your own!) in this creative sanctuary. Wonderfully quiet and peaceful, even with all of the French doors and windows open, this home gives you the privacy you need to tackle your next creative project. Perfect for when the weather is warm, but really suitable any time of year in this temperate climate, the pea gravel patio also includes a gas grill and outdoor dining table with four chairs, overlooking the gorgeous forested landscape. During your stay, you'll be near beaches and only about a five-minute drive to downtown Bainbridge, where you can stop for a quick bite at a local eatery or browse novelty shops for the perfect gift to bring back home. Stoke your artistic flame with a day trip to Seattle - just a few miles from the ferry terminal, a ride by boat over to the city means some of the most breathtaking views of Seattle available and a chance to explore its urban downtown. From attractions like Pike Place Market and the Space Needle to small coffee shops, hole-in-the-wall bakeries, and hidden away bookstores to suit even the most voracious reader, this gorgeous and eclectic city is well worth a visit. 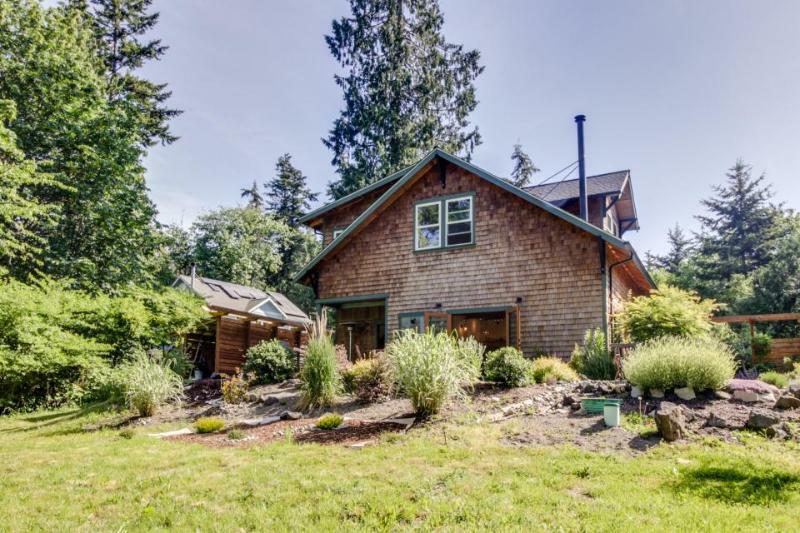 Book today and enjoy peace, quiet, and art at this lovely and bright vacation home on Bainbridge Island. Nightly rent rates were accurate when we last updated this page, but please contact Vacasa for a detailed price including taxes & fees. For live price quotes, availability, and secure booking, you may also visit: www.vacasa.com/unit.php?UnitID=5789&FKLI;=1 When calling Vacasa, you may reference Property ID#: 5789 Additional amenities include: washer / dryer.